I mean pockets full of cash and wallets bursting at the seams rich. How? What I’m about to tell you may seem counterproductive to your goal but trust me, it works. 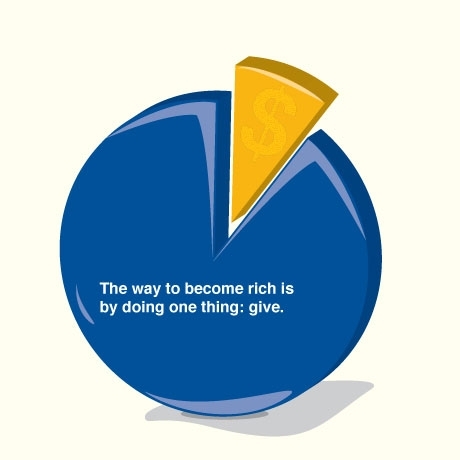 The way to become rich is by doing one thing: give. In Surah Baqarah we read, “The likeness of those who spend their wealth in the way of Allah is as the likeness of a grain that grows (into) seven ears, in every ear a hundred grains, and Allah multiplies for whom he will. And Allah is all-sufficient for his creatures’ needs, all-knower” (2:261). So say you give one dollar to a person in need. According to this ayat, Allah will return that to you sevenfold, turning your one dollar into seven dollars. Donating to charity is a way for Muslims to purify their wealth; by giving a small part of you earnings away you remove the possibility of having any doubtful wealth such as interest. How many times have you felt like you were running low on cash when, out of nowhere, you seem to come upon enough to, Alhumdulillah, cover your expenses? Those things that we often consider coincidence are more often Allah’s mercy raining down upon us but we take little notice of them. But I know what you’re about to say. You’re only a student or you’re making merely enough to get by and you’re just unable to give right now. So take an empty jar and every Friday put a quarter, a dollar, a check, an IOU — whatever you can — and put some money aside for those who are struggling to get the things you don’t think twice about like food, water, shelter and clothing. Whether you want to donate to people in Somalia who are living in famine and drought, or Syrian refugees who are seeking political asylum, find a charity you can trust so you can be confident about where your hard-earned money is going. If you feel like you want to give but you’re unable to, volunteering your time is another way to perform charity. Find a local organization that does something you can be a part of like volunteering at a soup kitchen, organizing a food pantry, or collecting sweaters and clothes to keep someone warm this winter. In another hadith from Bukhari, it states that our Prophet (saw) said, “If any Muslim plants any plant and a human being or an animal eats of it, he will be rewarded as if he had given that much in charity.” Find a way to give that best suits you and stick to it in 2012, making this the year you did something good not only for your wallet, but for someone in need.